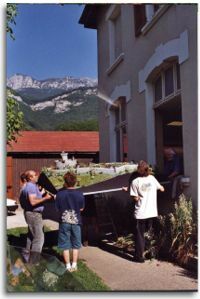 The Atelier des Dauphins (Workshop of the Dauphins) was created back in 1992. Its objectives were to discover and promote the various historical buildings of the Grésivaudan valley, most of them being ruined today. The most spectacular output of our work is the assembly of scale models of medieval castles. Sources used to recreate them include all texts and accounts of the Middle Ages giving clues about how these buildings looked like at the time of their splendor. We also carefully study the location of these castles and try to understand the layout of the various remaining stones. Historical accuracy is what we are looking for but we want to share our findings with people whose interest in history can be very limited, hence always trying to remain fun. First scale model of the Castle of La Buissière, from a 1339 account. Scale model of Fort Barraux in early 19th century. Scale model of the Castle of Avalon, from the 1339 account. 2005 Scale model of the Castle of La Terrasse, from accounts of 1339 and 1418. 2006 Scale model of the Fort of Mont-Briton, from the accounts of the castle of Montmélian.